Among the many movies that I have watched, this must be the one with the longest title. And with 3 hours running time, one of the lengthiest ones too. The biopic on the charismatic Indian cricketer brings out hitherto unknown aspects of his life. Not many know that his is more or less a rags-to-riches story. It is for this reason, the movie is sure to inspire many youngsters who hail from modest backgrounds to pursue a game which many think is a rich man’s preserve. The movie also drives in a strong message to Indian parents to allow their children to pursue their passions. Undoubtedly, there is more to life than just academics. It is criminal to waste one’s talents. Dhoni’s climb up the ladder has been anything but rosy. This is best portrayed in his stint as a ticket collector in the railways. The international cricketer in the making went through quite a few phases of uncertainty bad enough to break a man. 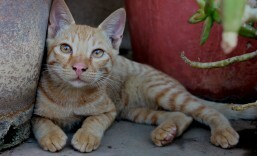 Resilience, will power and a good circle of friends came to his rescue. Sections on the cricketer’s relationships complete with the signature Bollywood flavour add to the romantic element in the movie. The actresses portraying Pallavi Jha, his first girlfriend, and Sakshi, his wife, are stunners. The choice of cast is very apt. Sushant Singh Rajput as Dhoni has perfected the art of playing a cricketer, this being the second time, the last one being in “Kai Po Che!” The same applies to the make-up artistes. It is not easy to make a 30-year-old actor look like a 15-year-old high schooler (in the portions related to the cricketer’s school days). A movie worth watching for both the young and the old. A little Pakistani girl with an angelic face gets separated from her mother while on a pilgrimage to India. She is spotted, fed and fostered by the hero, a small-time pahelwan (wrestler) and die-hard Hanuman aka Bajrangbali bhakth (devotee of Bajrangbali). Because of his devotion to Bajrangbali, he is fondly called as Bajrangi Bhaijaan. Getting family details from the little girl is tough as she is speech-impaired. How would Bajrangi Bhaijaan know that she is from Pakistan? And how would he unite her with her parents with little or no information? Bajrangi Bhaijaan and his fiancée Rasika have a tough job on hand. Bajrangi Bhaijaan is a must watch. It is entertaining, colourful and an armchair journey through beautiful Kashmiri locales. The emerald green mountains are a visual treat and make you want to go there. The buses in the region are quirky and are ornate with colourful pop-art. Kareena’s endless array of oxidised earrings enliven her Manish-Malhotra-designed salwar suits. 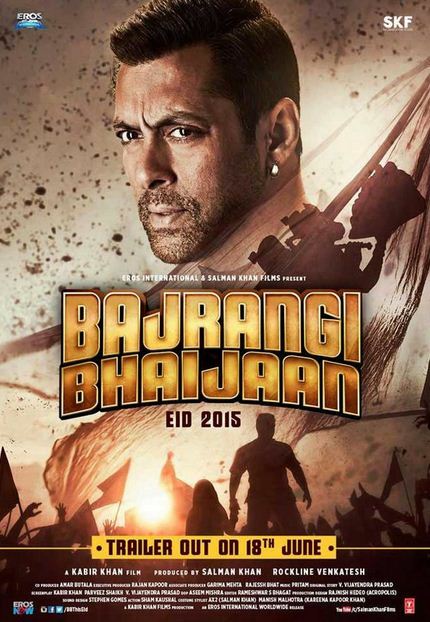 I am expecting a ‘Bajrangi Bhaijaan’ collection of earrings and salwar suits to adorn market shelves soon. And there is more! A disheveled dude provides some comic moments on the Indo-Pak border as Bajrangi Bhaijaan attempts to cross the barbed wire fences without a passport and visa! Then there is Nawazuddin Siddiqui who has essayed the role of a clever Pakistani journalist Chand Nawab with gusto. Even if he has done only a cameo role, Om Puri is simply outstanding as a Maulvi. You’ll just love the scene where he is riding the scooter with his two ‘begums’ 🙂 Jai Bajrangbali! Last Saturday started on a memorable note. 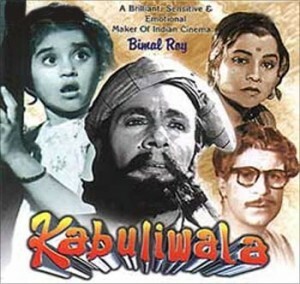 I happened to watch ‘Kabuliwala’, a yesteryears’ Hindi classic based on the story of the same name by Rabindranath Tagore. The film was screened at the National Gallery of Modern Art auditorium as part of the outreach programmes for ‘The Last Harvest’, an exhibition of paintings by Rabindranath Tagore. I was so touched by the story it drove me to tears. The story starts in Kabul, Afghanistan. Abdur Rehman Khan (enacted by Balraj Sahni), a Pathan trader, falls into bad times. His little daughter Amina had recently fallen ill resulting in Khan, a widower, spending a huge amount of money on her treatment. He had borrowed heavily and owing to a drop in business was unable to return the money back. He decides to go to India to sell his merchandise and return to his homeland after clearing his debts. Bidding farewell to his aged mother and little daughter is painful. While the little one is asleep he manages to get her palm impressions on a piece of paper that he would carry to India. He leaves early in the morning before she wakes up. Khan arrives at Calcutta along with a group of fellow Afghan traders. He peddles his ware (dry fruits and shawls) across the streets of Calcutta. The Afghan traders are called ‘Kabuliwalas’ in the Bengal capital. For some reason, Kabuliwalas are a feared lot in the city especially among children and mothers of young children. Stories of Kabuliwalas kidnapping young children in their huge bags abound in the city. If a child refuses to eat, his mother scares him into eating by telling him that the Kabuliwala will put him in his sack if does not obey. Abdur Rehman Khan is big and burly like many Kabuliwalas. The sight of him sends children scurrying to their homes. Once when he approaches a group of children they all take to their heels except one little girl. She is Mini, daughter of a writer (enacted by Sajjan), very much the same age as his daughter Amina. He goes down on his knees and puts his arms over her shoulders. She smiles and runs saying, “Kabuliwala”. She tells her mother (enacted by Usha Kiran) about a big Kabuliwala with a big bag whom she has just seen outside their home. Her mother warns her that the next time he would put her in his bag and take her away. Unlike his wife, Mini’s father has no issues with Kabuliwalas. The next time Khan comes near their home, Mini shouts out “Kabuliwala” and hides. Khan enters their compound but does not see Mini. Hearing his voice, Mini’s dad comes to check what he wants. Khan tells him that his little girl has just called out to him. Mini’s dad finds Mini and gets her near the Kabuliwala. Khan offers her some dry fruits but refuses to take money. Mini’s dad coerces him to take it. After this meeting Mini does not fear Khan and Kabuliwalas. She chats with the Kabuliwala every day much to the consternation of her mother. Her father is unperturbed and he even invites the Kabuliwala inside his home and asks him about Afghanistan. When stories of kidnappings surface, Mini’s mom gets her silver anklets so that she can trace her whereabouts through the jingles. But Mini knows how to dodge her mother. One day Mini invites Kabuliwala home for her birthday which is the next day even as her mother watches the two conversing from afar. She chides her husband. As the house will be thronged by visitors and children, Mini’s father calls out to Abdur Rehman Khan and asks him to keep away from the house for a few days. Khan agrees only to surface in the house on Mini’s birthday. He tries to keep a gift for Mini in the house without attracting anyone’s attention. Mini’s father notices him and gets annoyed. Khan slips the gift in Mini’s father’s hand and scoots. Mini’s father does not tell this to Mini. After the birthday celebrations get over Mini waits for the Kabuliwala to offer him sweets that she had specially kept aside for him. It is a rainy day. She gets impatient and leaves the house to find him and hand over the sweets. In the process she is away for a long time. Her parents realise her absence and her father and servant leave home to find her. In the meanwhile Abdur Rehman Khan comes to know of Mini’s absence and he also sets out to find her. It is he who finds her after passersby notice a child sleeping near a pavilion. He takes her in his arm, she offers him the sweets. It is then that the servant notices them. Misled by him that Kabuliwala is a kidnapper, people around start thrashing Khan. Mini’s father arrives in the nick of time and learns from Mini about what had happened. Mini’s father saves the Kabuliwala from further attack. When Mini falls very sick, the Kabuliwala refuses to move away from the gate till she recuperates. All the time he offers prayers to the almighty. Mini’s father is touched by his gesture. One day after he has finished with a day’s work Khan returns to his dwelling to find his fellow countrymen sing about his homeland. Abdul Rehman Khan becomes emotional and pines for his daughter. He has already cleared all his debts. He decides to collect his dues from all those who had borrowed from him and then return to Afghanistan. What could have been his last few days in Calcutta become a nightmare. A man who had bought a shawl from him on credit refuses to acknowledge the same. He instead swears at Khan and manhandles him. Enraged, Khan stabs him to death. The police take him away. On the way to the police station, Mini and her father notice Khan being taken away. Khan falls on his knees and speaks to Mini and weeps not telling her where he is being taken away. The best efforts of his Afghan fellow traders and an expert lawyer fail to get Khan relief from imprisonment. The judge as a gesture of Khan’s honesty in accepting to having committed the murder waives the death sentence and instead grants him 10 years rigorous imprisonment. After 10 years Khan is released. He just can’t wait to talk to Mini. On the way he buys bangles for her and goes to her house. Mini’s marriage preparations are underway. Her dad notices Khan and is happily surprised. Khan asks for Mini to which her dad says that he cannot meet her. Khan then gives him the bangles and asks him to give them to her. Touched by Khan’s show of affection, Mini’s father calls out for Mini. Mini arrives in her wedding finery. Not realising that his Mini is now a grown-up girl all set to be married Khan looks around for the little girl whom he last saw 10 years back. Her father asks Khan to have a look at the girl who is now standing in front of him. It is then that Khan realises that Mini is no longer the little kid he once knew. She cannot even recognize him. An inconsolable Khan then remembers his daughter Amina and wonders if she would recognize him. Filled with emotion Mini’s father asks Khan to return back to Afghanistan and re-unite with his daughter. On realising that Khan has no money to afford the return back home, Mini’s father decides to hand over the money he had saved for the marriage music band and lighting to Khan. Though Khan refuses, Mini’s father asks him to take it as a gift from one father to another. Mini gives one of her bangles as a gift for Amina. Khan finally accepts the money and the bangle and bids a tearful goodbye to Mini and her father. Balraj Sahni’s portrayal of the Kabuliwala is simply superb. His Kabuli diction and emotions at the end of the film are priceless. Sonu is adorable as Mini. Sajjan plays the perfect dad. This song sung by Hemant Kumar has very meaninful lyrics. At the end of the song Abdur Rehman Khan asks the singer what the song means. The man says that though night and day are so different as dusk falls we hardly see any difference between them similarly whatever the difference between human beings be it caste, creed or colour the feeling of love exists in all of them and cannot be distinguished. The song sung by Manna Dey which makes Khan pine for his daughter and return to his homeland. The movie is on YouTube. Do watch it!